‘Betulia Liberata’ is a well-known libretto by the most prominent poet and librettist of the 18th century, Pietro Metastasio. It is based on the book of Judith, from the Apocrypha of the Bible. The subject was used by many composers during the 17th and 18th centuries. Wolfgang Amadeus Mozart (1771) and Johann Gottlieb Naumann (1796) are only two of many composers of the 18th century who used Metastasio's libretto. Naumann was the dominant musical personality in Dresden between Johann Adolf Hasse (1699–1783) and Carl Maria von Weber (1786–1826). Here he also received his first musical education at the Kreuzschule. As a teenager he travelled to Italy to broaden his horizons. There he met, among others, Giuseppe Tartini and 'Padre' Giovanni Battista Martini. After his return to Dresden he became chamber and church composer in 1765 and Kapellmeister in 1776. Ten years later he was appointed Oberkapellmeister, a clear sign of great appreciation by Prince Elector Friedrich August III. It was therefore no surprise that the Prince Elector himself asked Naumann to write an oratorio for Lenten season in 1796. Naumann, being in poor health, refused. As a result the oratorio for that year was written by Joseph Schuster (1748–1812), Saxon court music director since 1787. Naumann nevertheless started to work on the oratorio, which was completed shortly before Pentecost. It was therefore not performed, but was kept by the Prince Elector. Nine years later, four years after Naumann's death, the oratorio was finally given its first performance. The reasons for this were twofold: Naumann was still held in high esteem years after his death, and the subject of the oratorio was very appropriate in regard to the political situation. The Electorate of Saxony was under constant threat from France, and in 1806 its resistance finally broke down. 'Betulia Liberata' is about the city of Betulia in Israel which is beleaguered by the Assyrians. Its situation is becoming more precarious by the day, and the inhabitants begin to consider surrender. But then one of them, Judith, announces that she has a plan to liberate the city. She leaves Betulia and visits Holofernes, the captain of the Assyrians. She has dinner with him, and when he is drunk she kills him with his own sword and takes his head with her to show it to the people. It is the beginning of the end of the siege of the city. Metastasio had no political situation in mind while writing the libretto, and many composers in the 18th century had used it without any political motive either, but in this case it is hard not to connect the oratorio's subject with then current affairs. The same subject had been used by Vivaldi (Judita triumphans) in 1716, when Venice was threatened by the Turks. Considering the change in taste during the last quarter of the 18th century it may be surprising that Naumann used this libretto, as Metastasio is mainly associated with a time in which musical life was dominated by royal and aristocratic courts. Dresden was one of those places where not that much had changed: as late as 1821 another oratorio on a libretto by Metastasio was performed. Naumann pays tribute to the changing taste of the time, though: not only is the libretto abridged – he omitted several arias which are included in, for instance, Mozart's setting. He also made cuts in the recitatives and breaks with the pattern of an endless sequence of (secco) recitatives and arias by creating larger scenes in which recitatives grade into an aria or vice versa. Some recitatives are interrupted by choruses, and there are a couple of arias for solo and chorus. Almost all the recitatives are 'accompagnato' where the voice is supported by the orchestra. Only in some passages where no action is involved – for example the dispute about religious matters between Ozias and Achior – does Naumann make use of the secco recitative. One could argue that this oratorio is not really dramatic. For instance there is no direct confrontation between Judith and Holofernes: the latter doesn't even appear in the oratorio - as in Vivaldi's oratorio mentioned above. What has happened is told by Judith, and is therefore considerably more static. The most dramatic part is at the start, when Ozias, the governor of Betulia, is accused of inaction by the noblewoman Amital, who pleads for surrender. It is the way the different protagonists deal with this situation which is the main attraction of this oratorio. The performance doesn't make the mistake of trying to make this work more dramatic than it is. Ozias is sung by Markus Schäfer, who is not to everyone's liking judging by the reviews of some of his recordings, probably because his voice is a bit sharp. But I mostly like his performances, because he articulates very well and differentiates very convincingly in the realisation of his part here. Salomé Haller gives a good portrayal of his critic, Amital, who is a bit of a spitfire. Judith is quite different: quiet and unflappable, with a great trust in God. Nele Gramß gives a fine account of her role. Her report of her actions after her return into the city could probably have been a little more declamatory. Harry van der Kamp (Achior) is especially impressive in this respect, when he reports how he has been left by Holofernes, and in his dispute with Ozias. Hans Jörg Mammel has a rather small role as Carmi, a leader of the people, which he realises well. The Rheinische Kantorei is perhaps a bit small with just sixteen voices, but they sing the choruses very well. After all, they are one of the finest choirs in the early music scene. And the orchestra, almost always in action during this oratorio, validates its reputation by giving powerful and colourful performances of the orchestral part. With this recording Hermann Max continues his exploration of the German oratorio of the 18th and early 19th centuries. This has resulted in a series of fine recordings, like the one reviewed here. I hope he has the opportunity to continue. 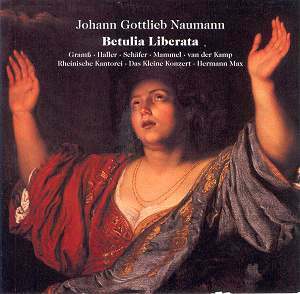 It is to be hoped that this will result in recordings of some of the other eleven oratorios by Naumann, who was an interesting and very fine composer, as Betulia Liberata testifies.